Saturday February 28th 1891 I was busy about the work all forenoon. Lee was home to dinner. I worked on the net considerale today. Will went to town in the evening. I wrote a letter to Lizzie D. Sunday March 1st 1891 It was a snowy unpleasant day. I was busy with the work all the forenoon as I let Agnes go home for the day. Lee came home to supper. I read what spare time I had. Monday March 2nd 1891 It was snowing this morning but we washed and put part of the clothes in the garret. I went over to Fannys in the afternoon. I am still working on Lizzies fly net. Tuesday March 3rd 1891 I got the clothes in the garret ironed today and the rest of them up to dry. Will helped Woolf folks move. It was a cold day. I wrote to Mother in the afternoon. Wednesday March 4th 1891 It was a very cold day. I had baking and some extra work to do. I wrote a letter to Lizzie Duncan. I was working all day on Lizzies net. I have it nearly done. Thursday March 5th 1891 We got the rest of the ironing done before noon and in the afternoon I drove the black horse out to Fannys while Will hitched Kitt up to show her to Mr. Schell. He sold her to him for $140.00. Fanny was feeling pretty well and we had quite a visit. There were others in though. Friday March 6th 1891 I was busy about my work all forenoon and Will took me out to Fannys to spend the afternoon. She did not feel so well as yesterday. Hattie did not go out. 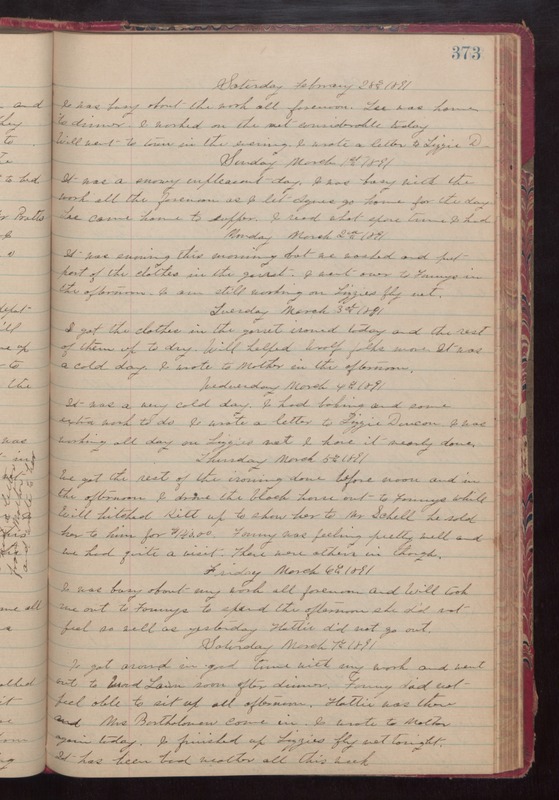 Saturday March 7th 1891 I got around in good time with my work and went out to Wood Lawn soon after dinner. Fanny did not feel able to sit up all afternoon. Hattie was there and Mrs Bartholomew come in. I wrote to Mother again today. I finished up Lizzies fly net tonight. It has been bad weather all this week.